Not long ago I found a small brown bird perched on the step at the back of my house. Just sitting there. It didn’t fly away, even when I reached down and gently picked it up. Small and remarkably round, the bird fit nicely into the palm of my hand. It was still alive, but appeared to be unconscious. I figured it must have flown into the glass door, thinking it could fly straight through the room and out the window on the opposite side of the house — the same way these little birds zip through the thick brush outside. My examination of the dazed bird was interrupted by a commotion in a large rhododendron bush behind me. It was another bird, sounding very agitated. Although I couldn’t see it, I was sure it must be the mate to the one I held in my hand. Spurred to action, I glanced about the yard for some place safe, high enough to escape the notice of cats, where I could set the injured bird to allow it to recover in peace. The only spot I could think of was the roof of my teahouse, which was some distance away. Cupping my other hand over my little passenger I set out across the yard towards the teahouse. As I moved up the path I felt the bird’s feet grip my finger. Nestled in a small clearing surrounded by dense brush and moss covered pines, the teahouse seemed a good place to set an injured bird. I reached up and carefully placed it on a shingle near the edge of the low roof. I checked back occasionally to see if the bird was any better. It just sat there, beak hanging open and eyes glazed over. I began to doubt it would make it. I decided that if it didn’t recover by nightfall, I would bring it in and put it in a box over a heating pad. I remembered seeing a pair of these birds, a few days earlier, as they bathed at the edge of the small pond near the house. Plain brown, round, with no neck, and eyes on either side of their body, they were not much bigger than ping-pong balls, with perky tails that bobbed up and down as they flitted busily about. One bird would bathe while the other stood guard perched on the head of a stone stature of Kwan Yin that stands at the edge of the pond. As it was starting to get dark, I walked back and peered up at the teahouse roof. The Wrentit hadn’t moved. I reached up, intending to take it into the house, when suddenly I heard a noise off to my side. On the ground only a foot or two away was another little bird. It was jumping frantically from side to side, looking up at me and emitting a rapid series of trp trp sounds that managed somehow to simultaneously communicate encouragement to its mate and alarm at what I might do. I was stunned at the depth of feeling in those odd notes. I quickly left the scene and circled around behind a clump of trees. A few moments later I returned from another direction. Both birds had disappeared. All that remained on the roof where the comatose bird had been was a small pile of white birdshit. Later I was told that birds that smash into windows will sometimes abruptly come-to like that. But what stuck in my mind was the devotion of the bird’s mate. 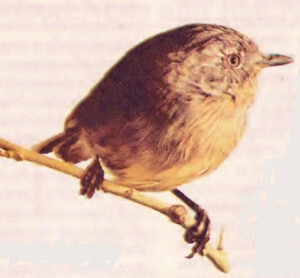 Now, when I sit meditating in my teahouse, I frequently notice the Wrentit’s distinctive song (two notes followed by a receding burst of stacato notes) and I’m reminded of the love these little brown birds have for one another. Humans, the strange featherless bipeds who have wreaked so much havoc on the natural world, are not the only creatures capable of deep feelings for one another. Love plays an important part in the preservation and continuance of every species. I think love serves a higher evolutionary purpose as well. It’s been said that all love is really self-love. The Wrentit was trp, trping because he thought he was about to lose his little puff-ball. I know how he feels. For most of us love does not extend very far beyond our immediate circle. We only love those who are closest to us, or those who are like us. But human beings are also capable of a higher, more unselfish form of love, in which our separate individual self dissolves. Then loving and caring for the world is loving and caring for ourselves. *This piece first appeared in Coast Magazine in 1996. I posted it here so that it will go into my permanent archives. Followed your link from Freesangha. Nice website. I can see that you enjoy writing, especially about the dharma, and I’ll certainly bookmark and visit regularly. I recently retired from teaching and have taken up writing about what happened to me during 30-odd years of meditating. I’ve always been interested in Zen and how it changes you. Which is what got me into meditation in the first place. As someone who taught all subjects to young children I wanted to know if there were any types of knowledge I hadn’t got access to, and decided to use meditation to change how I perceived the world. Very dangerous, as I found out when, much to my surprise, it really worked. Enough of me. Just wanted to say that I enjoyed your writing. I’m writing on forums as stillpointdancer, which describes what I feel during moments of insight. Thank you for your kind comment. I like hearing about the experiences of fellow practitioners. I notice you’ve got a book out. I don’t usually read contemporary writing — just the classic zen masters and sutras, over and over, but your work sounds interesting. I do like to write, but it tends to put me in a frame-of-mind that isn’t conducive to meditation, so I don’t do it very often. I’m about half-way through a memoir, that I’ve been fooling with for years, focused on my time in the San Francisco of the sixties. I think it’s a good story, but I don’t know if I’ll ever finish it. However, writing it has affected me more than I thought it would. I like rewriting the classic sutras, trying to get around the jargon to make things more accessible. Not easy, but makes for a great challenge and helps me understand more. I’m a retired Primary school teacher, used to putting over science and technology concepts in a simple way for young children- believe me you learn more doing that than what you ‘thought’ you knew. And those are things of our own time and culture! Much trickier when it’s something like a sutra. It’s only since I’ve retired that I had the time to try writing, and so I had a go at the Saipatthana Sutta, the guide to insight meditation. My book is a modern ‘take’ on it, in my own words and following what I did to myself- a sort of reverse engineering. Zafrogzen: very glad to have found your webpages (picked up the link from ‘FreeSangha’). You make sense, and I look forward to reading more of your thoughts, both here and on the forum. Writing about the problems of using mindfulness in corporate, and other, training programmes. What do you think about the use of stuff like this, out of it’s Buddhist context and in a ‘completely secular’ way? My own thoughts are that such practices could have unexpected consequences for the practitioner, without the kind of backup you would have in a Sangha. Sorry I didn’t get your comment posted earlier. I’ve been on a solo semi-retreat for awhile. I really appreciate your feedback. I hadn’t thought about any of my stuff lending itself to corporate training programs. I’m very curious to know which practices you (and Allen?) think could have “unexpected consequences” and what those consequences could be and how a sangha and a “Buddhist context” might mitigate them. When I was writing about “identification” and the Bhagavadgita, I wondered how that practice might work in a secular context. I think there’s always the possibility that some individuals with mental issues can misuse such practices — as I think we see sometimes on the Freesangha discussions with regard to Buddhism. Obviously taking Datura is very dangerous, but I wasn’t suggesting it as a practice. For what it’s worth, I did just add a warning at the end of that post, I’m eventually going to take down those posts that are from the memoir I’m working on. The sixties were pretty crazy, but since then my life has been quite normal. Did you read my “meditation basics?” Is there anything in there that you think might be inappropriate? I originally wrote that for a few people I know who I thought would be interested. It’s all basic practice I learned from various teachers, which I‘ve done for decades with only positive effects. It’s said the yogic breathing exercises when done with breath retention (which I warn against) can be dangerous, although I’ve never had any unintended consequences (except for doing stupid stuff when driving down the freeway). I’ve read that intense meditation has had very negative mental effects on a few people, but that was from jumping right into extended retreats with teachers and a sangha, not from solo practice. I think it would be very unlikely that someone who was new to meditation would have the willpower to do enough intensive sitting on their own for any unintended consequences to occur. Practicing on one’s own is always more difficult. I’ve been having trouble staying off the internet while trying to do some serious sitting. BTW I enjoy your posts on Freesangha.